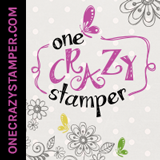 Lora's Crazystamper Blog: Bye Bye Boy....Happy Birthday!! Okay so who thought I wasn't going to post another card anytime soon??? Ahhhh but here I am!! I actually have several cards in the hopper ready to post for you all over the next little while. So here's my thought...I figured that if I could get a bunch of cards ready to post, while I kept making more, I might actually be able to post on a regular basis.....let's see if this little brain wave of mine works!! This is a card that I made last weekend for my Godson's 1st Birthday. We bought him a convertable stroller/tricycle thing...it was pretty cool. So when I scouted the store for the right image this one from Stamping Bella called Bye Bye Boy pratically jumped off the rack at me. I LOVE this card Lora....that image rocks! I have the little girl...they are so sweet!